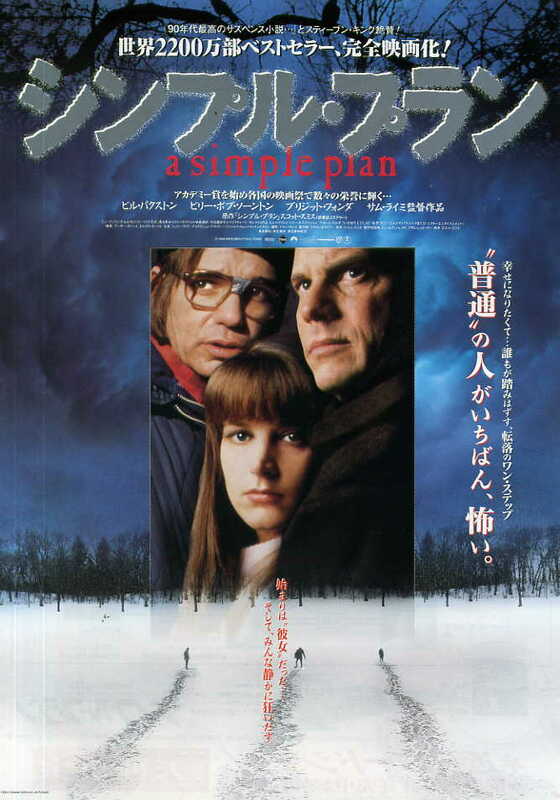 A Simple Plan is one of those movies that is destined to be forgotten. This is nothing out of the ordinary. There are lots of films that disappear from the public consciousness, but few of them are as enjoyable as this one, and even fewer can boast such an exceptional cast. Nor can they lay claim to a director as consistent as horror icon Sam Raimi, who takes something of a departure from his usual comic book style with this taut and suspenseful thriller. Respected critics Roger Ebert and Gene Siskel gave the movie their thumbs up, while the former – the first recipient of the Pulitzer Prize in Film Criticism – ranked it at number 4 on his list of best movies of 1998. So how did a movie of such skill and pedigree find itself relegated to cinematic purgatory? Let us take a moment to consider. One of those reasons is undoubtedly its lack of success at the box office. Released in mid-December, the movie struggled to compete with franchise blockbusters such as Star Trek: Insurrection, while the success of surprise hits such as Shakesphere in Love, and the inevitable draw of Christmas romcom You’ve Got Mail – a quasi-sequel which reunited Tom Hanks and Meg Ryan following the much-loved Sleepless in Seattle – succeeded in dwarfing it. Traditionally, Christmas is a time of great sentiment, a period when people are drawn to movies which promote happy endings and wish fulfilment. So irrelevant to the festive season is A Simple Plan‘s macabre formula that it was even eclipsed by Michael Keaton’s tepid Christmas comedy Jack Frost. But it can’t all be about performance at the Box Office, particularly at a time when DVDs were beginning to come to the forefront. After all, there are lots of great movies that flunked at the theatres only to come to prominence as a top rental, The Shawshank Redemption being perhaps the most pertinent example of a cinematic late bloomer. So what other factors might be responsible for the movie’s relative anonymity? There are probably many small reasons ranging from star power to lacklustre promotion, but for my money it is a simple matter of its inability to become removed from another movie’s colossal shadow. 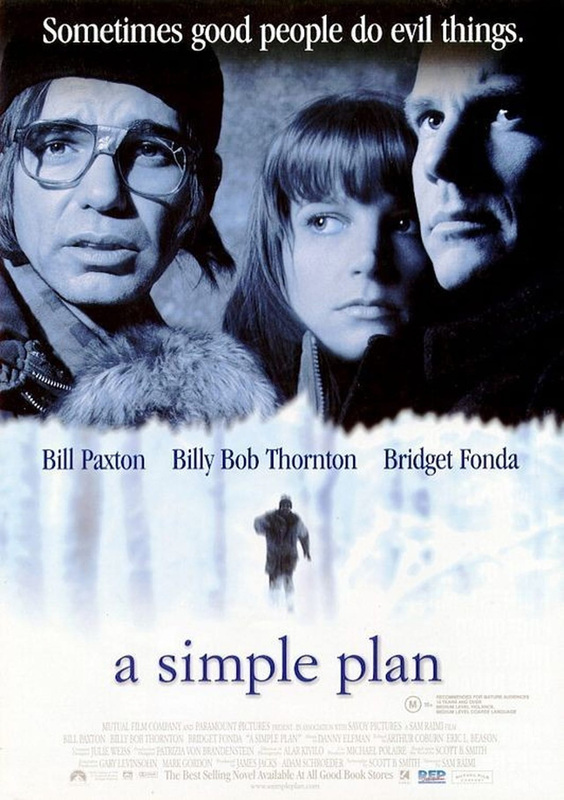 Released two years after Fargo, A Simple Plan shares many similarities with the Coen brothers classic, and it is almost impossible not to draw comparisons. For the most part this is unfair, because in spite of its snowy, small town landscapes and startling descent into the macabre, they are very different movies. Still, it is almost instinctive to compare the two, and though Raimi’s tale of temptation and deceit is wonderfully executed, Fargo is perhaps the greatest movie of its generation, one so unique that any comparisons drawn, regardless of how superficial, will invariably be met with cynicism. 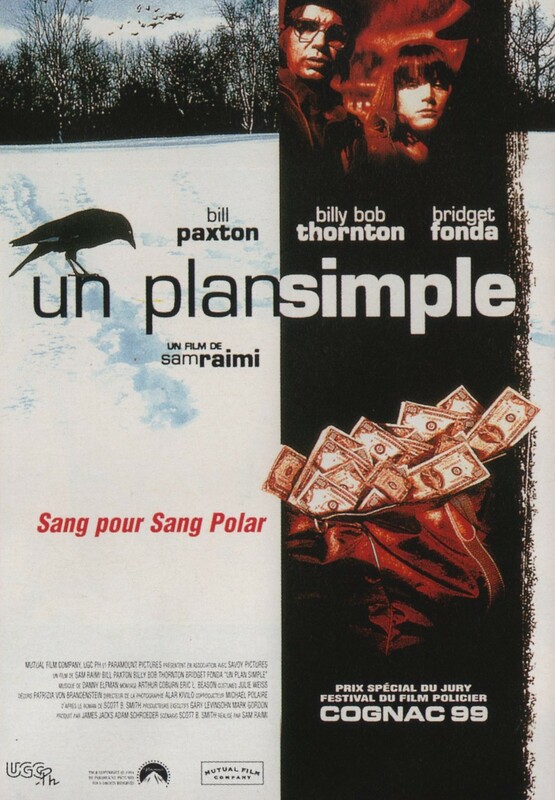 Both movies may concern unconventional crimes which plunge simple communities into extraordinary situations, but while Fargo‘s tone is deadpan noir, A Simple Plan is one which deals with characters who are very much grounded in reality. This is humourless, gut-wrenching fare, with some incredibly complex performances and a sense of community that never seems alien, in spite of the film’s outlandish qualities. There are no bursts of comic relief or abstract caricatures. This is a rugged Midwestern town with salt of the earth residents and old school values, a place where drunkenness and unemployment mask the inevitable effects of the growing technological revolution. Lou Chambers – It’s the American Dream in a goddamn gym bag! The movie involves three blue collar acquaintances. Hank (Bill Paxton) is a college educated accountant with a baby on the way. He and his wife Sarah (Bridgette Fonda) have earned the respect of the townsfolk with their sense of decency and public decorum, although his role at a local chicken feed store smacks of underachievement. Hank’s brother Jacob is the town imbecile, a simple soul who has accepted his role as an undesirable and who lives the lonesome life of a hobo in the dilapidated farm where they grew up. The last of their ill-fated triumvirate is Lou (Brent Briscoe). Lou is the outsider by bloodline, a drunken malcontent renown for his boozy antics and public spats with his loudmouth wife. In Hank’s eyes, Lou is an uncouth miscreant unworthy of his friendship. As far as Jacob is concerned, Lou is the only true friend he has in the world. One morning, the three men stumble upon a bag full of money in a marooned aircraft. A largely unemployed Lou is understandably over the moon and wants to dive right in, while Jacob drools and chuckles like a schoolboy. The responsible Hank is rather more cautious, but after weighing up the consequences he agrees to keep the money providing they sit on it until after the plane is found. Once they are sure that the money cannot be traced back to them, the three agree to split the loot and leave town forever. Later that week, a passing farmer almost stumbles upon their secret and a dumbstruck Jacob panics and strikes him with a blunt object which leaves him half dead. Between them, the brothers then contrive to murder the man and cover up the evidence. Jacob Mitchell – [speaking to Lou about Hank] You know we don’t have one thing in common me and him, except maybe our last name. You’re more like a brother to me than he is. Inevitably, trust begins to unravel and friendships are severely tested, especially when a guilt-ridden Jacob confides in his buddy, Lou. On the verge of losing his truck to gambling debts and stumbling from confrontation to confrontation, Lou is the obvious instigator, making a drunken threat regarding the accidental murder of the local man, but we later see him in a different light, as a loyal friend wracked with insecurity. In spite of appearances, both bestowed and embraced, Lou is a largely misunderstood individual whose low self-esteem and rung in society paints an unfair picture. Spurned on by softly-lit homemaker Helen, it is Hank who turns to the surreptitious in order to gain leverage over Lou. The resentful Jacob is soon coaxed into the bargain, and as the manoeuvres become increasingly elaborate, the path to redemption grows longer and more twisted, but this is a town run on established credibility, and never once is our leading man’s integrity questioned, a fact that an ever-demanding Helen is fully aware of as her propensity for greed and self-preservation begins to flourish. Sarah Mitchell – You’ve gotta remember how people see you. You’re just a normal guy, a nice, sweet, normal guy. The movie is about temptation, and the various effects it has on people. It is also about our perceptions of others and ourselves, about how character can be temporary, personality illusory and misleading. It is human nature to categorise. For one thing, uncertainty is the grounds for fear, and it makes us feel comfortable to imagine that we know our neighbours when in reality we only know what others allow us to see. People tend to accept their roles within a community, however inaccurate, and it is this acceptance upon which working communities are built. Unfettered, those foundations are fairly solid, but once things fall apart your role may come back to bite you in the neck, and others will be only too willing to take a chunk if it nourishes their communal investments. 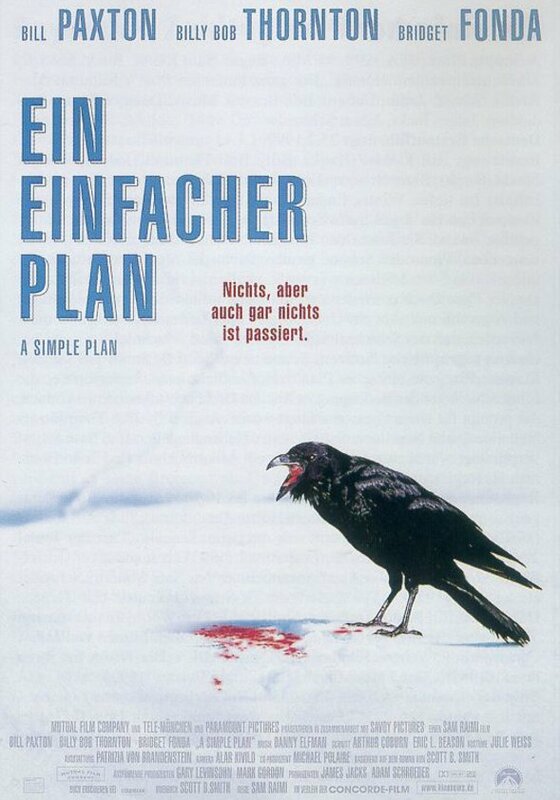 Raimi, renown for his often zany, quickfire direction, handles the movie with great care and austerity, forging a landscape of aimless desolation and dreary foreboding as the vultures adorn the spindling trees and winter lingers like the unceasing cold of their conscience. Ultimately, the movie belongs to Billy Bob Thornton, who slumps into the role of Jacob with a heart-wrenching docility. Jacob may not be the sharpest tool, but he is a man bereft of greed and all that it entails, and it is his quiet pragmatism that cuts through the insidious nature of the group’s preoccupations. Jacob has never kissed a woman, but he remembers the time a local girl dated him for a bet with great fondness. He knows that life is passing him by, but he is thankful for what little he has, and he could never perceive anyone as being beneath him because there is no such person, both literally and in the quiet wisdom of his heart. Society tends to pay very little attention to the village idiot, which leaves them a lot of time for observation. It is perhaps no surprise that those people tend to stick to the shadows.